With a Joyful and Full Heart! Gratitude! I have the best life I hope that my gratitude for the life I have been given comes across in my blog posts. I have had blessings in my personal life and business life that remind me everyday to give thanks. Thankful for the life I have been given and for the people I love and meet everyday is what I feel…alllll the time. 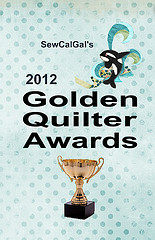 Recently, I got three notices that I had been nominated in three categories for the Golden Quilter Awards 2012. Let me just say that out loud again THREE CATEGORIES! sigh..heart racing. How cool is this???? The first for Best Designer…A comment. To be in this category is so special. When designing, (at least in my case), there are times when the design just flows and is so easy. There are times when it is like pulling teeth and I want to walk away. Then there is the “Will they like it?” voice. Then there is the “This is a bit complicated and not a make it in a hurry quilt, perhaps I should edit MYSELF!” the dreaded self doubt voice. Designing is so much fun and full of many voices. I might add that these voices and cause one to lose a lot of sleep! This nomination means the world to me! The voices will continue there is no stopping them! The second category for Best Author…Holey Moley the breath just got knocked out of me! When I started writing “Spotlight on Neutrals” I wanted to make a statement about using neutrals, helping people to view neutral fabrics with a different eye. I also wanted to write a Quiltmakers Primer with lots techniques (which I teach in workshops) and that could be used in any quilt. Then there was the private desire to write a book that was readable and had a voice, my voice…not just a book of patterns. To say that the book is well done and place me in this category..is quite simply the BEST! While I would LOVE your vote and you can go here to cast your vote… in so many ways…I’ve already won…see above! Thank you so much for the nominations! Go on now…..time to vote!